Formerly the assistant principal at Laguna Hills High School, Sam Oramas joins Rowland Unified from Saddleback Valley Unified. Oramas was responsible for discipline and attendance in Laguna Hills. He is now a new vice principal at Nogales High School. Earlier in his career, Oramas served as dean of students at Temple City High School, where he handled discipline. Oramas also taught math and social science at Downey High School for seven years. There he worked with at-risk students, as well as English language learners. Fluent in Spanish, Oramas received his doctorate in law from Brigham Young University and a bachelor’s degree in mechanical engineering. 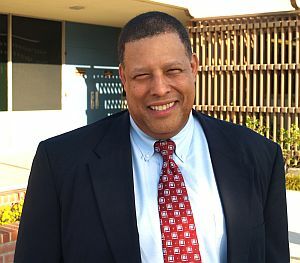 Doi Johnson is glad to be returning to his alma mater, Nogales High School, as a new vice principal. He looks forward to working with Principal Nancy Padilla at his old school. Johnson had been an assistant principal at Lynwood High School, where he was responsible for discipline, attendance and security. For 16 years, Johnson taught physical education at Jordan and Jefferson High Schools in Los Angeles. He had also been a special education math teacher at Gardena High School. Johnson also taught history and language arts at Eliot Middle School in Pasadena. Rowland’s newest administrator received his bachelor’s degree in Political Science from Whittier College. He earned a masters in administration from Pepperdine University. Rowland High School’s new principal, Mitch Brunyer, meets with ASB students, from left, Secretary Lillian Tao, President Alyssa Catinding and Treasurer Benson Chen. Mitchell Brunyer used to wrestle at Rowland High School. Now the former Raider will be wrestling with budgets and schedules at the local high school. Brunyer is the new Rowland principal, one of a handful of administrators to lead the Rowland Heights school. He is one of the new administrators named by the Rowland Unified School District, including two new vice principals at Nogales High School. The 1989 Rowland grad replaces Robbie Robinson, who retired to spend more time with family after 40 years of service to Rowland Unified. The new principal looks forward to many years at his alma mater. The 38-year-old is glad to be back. The Walnut Valley Unified School District Board of Trustees recognized 29 young artists for their recent success. The fifth grade students had submitted winning entries in the annual Music K-8 Cover Contest. Their work was selected from over 16,000 nationwide entries. Music Specialist Judy Brunelle introduced her students as they received Certificates of Award and color copies of their artwork. The winning entries appeared in the June issue of the Music K-8 magazine. There were several categories of winners. The top winners were: Samantha Yang of Quail Summit Elementary, who was first runner-up and won $125; Eunice Chung of Maple Hill, also a first runner-up and winner of $125; and Serris Lew of Westhoff, who was a second runner-up and winner of $100. The top finalists were Sarah Wang, Jessie Wang and Nadine Linn of Westhoff; Victoria Shen, Betty Kim and James Park of Maple Hill; and Eric Chen of Quail Summit. The finalists were Stephanie Yang, Nicholas Huang, and Sandy Pan of Evergreen; Sejin Park of Walnut Elementary; Jessica Lai of Collegewood; Derek Wan of Westhoff; Mark Shin of Castle Rock; and Nicolas Zhou, Asaan Barlas, Luis Choa, Angela Hou, Brandon Chen and Emily Su of Quail Summit. The final group of winners received Honorable Mention: Amber Min of Castle Rock; Jedidiah Hu of Walnut Elementary; Eric Liu of Quail Summit; and Gabrielle Thornock and Justin Kim of Evergreen. Congratulations to Rowland High School students Josh Cruz and Paulina Lim on their selection as participants in the Career Technical Student Organization Leadership Summit. During their five-day visit to Sacramento, Cruz and Lim learned about the government and the importance of being an informed citizen. They met many state officials and used the actual Senate Chamber to debate and vote on mock legislative-based issues. Best wishes to Maureen Scanlon and Tom Scanlon on their retirement after serving the Hacienda La Puente Unified School District for many years. Maureen Scanlon retires after serving the District for 40 and one half years. Her most recent position was associate superintendent of Human Resources. She began as a teacher at Bixby then at Mesa Robles, and advanced into administrative positions at Mesa Robles and Nelson. Scanlon moved to District positions in 1993, serving as director of Personnel Services and assistant superintendent for Pre-Kindergarten and Child Development. Her final position began in 2000. Tom Scanlon has served HLPUSD for 40 years, with most of those years in a district position. 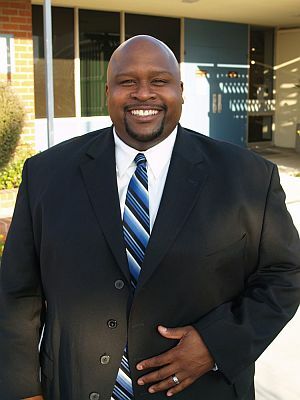 He began as a Social Sciences teacher at Los Altos High School, then moved to positions as resource teacher, general consultant and finally as director of Instructional Support/Curriculum. The district will honor the Scanlons on Aug. 14. They will be officially retired on Aug. 28. We wish them well and thank them for their service. The Rowland Unified School District will become the first in the state to operate an online high school through iQ Academy. The School Board Tuesday night approved the virtual charter high school where students will take courses online. including Ventura, San Bernardino, Orange and Riverside. Each student who enrolls in the academy fulltime is provided with a laptop and can take all their high school courses online. There will be centers available where students can come to get extra tutoring, officials said. The academy currently operates virtual schools in Arizona, Minnesota, Nevada, Wisconsin, Texas, Washington and Kansas. the 15th consecutive year, the Child Development Center at Mt. Program to all children who attend the center. semester credit classes online starting July 22 through Aug. 19.
students are required to activate their new Mt. SAC accounts at https://my.mtsac.edu/claim.html. students must submit an admission application online at www.mtsac.edu. the required orientation session before registering for classes. begin on Monday, Aug. 24. Office at (909) 594-5611, ext. 4415, or visit www.mtsac.edu.